Constipated dog symptoms include your dog noticeably straining to have a bowel movement, small and hard feces, or perhaps your dog tries to move his bowels but nothing comes out. You dog’s abdomen may also become tender or swollen. 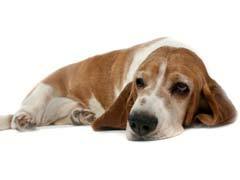 Pancreatitis in dogs can also cause abdominal pain. If you suspect that your dog has pancreatitis, it is important to seek medical attention. Constipation in dogs could be caused by a lack of fiber in the diet. Dehydration also causes constipation. Sometimes the dog swallows a piece of bone or some grass that cause a blockage resulting in constipation. You can try some of these constipation in dogs remedies. If the dog does not get relief in a day or two, see your veterinarian. When your dog is constipated, you want to provide relief. One very good constipated dog home remedy is canned or home made mashed pumpkin. If you buy canned pumpkin from a store, choose plain pumpkin and not pie filling! Pumpkin has water and fiber that help soften the stools. Pumpkin is also useful in preventing constipation in the first place. If your dog weighs less than 15 pounds add 1 or 2 teaspoons of pumpkin to the food daily. A 15 to 35 pound dog should be given about the same amount of 1 or 2 teaspoons. Dogs who weigh more than 35 pounds should be given from 1 to 5 tablespoons. Another constipated dog home remedy is to add one tablespoon of mineral oil to the dog’s food for every 25 pounds the dog weighs. Two or three spoons of wheat bran or breakfast cereal with high fiber content added to daily feedings is another excellent constipated dog home remedy. Never feed a dog walnuts or chocolate as they can be harmful to dogs. If your dog is prone to constipation, remember that the best constipated dog home remedy is prevention.